When the news broke that Chetan Bhagat was being sued for plagiarism, I wasn’t so much shocked as incredulous. In all the reviews, including my own, no one had raised a red flag that One Indian Girl was not a Chetan Bhagat book. In my review, I outlined the “5 points readers expect from a Chetan Bhagat novel.” Those 5 points constitute concrete elements of Bhagat’s brand identity. To build a successful brand requires a clear picture of what that brand is and how it will be communicated to the intended audience. In corporate communications, we use branding and style guides to do that. These guides can include rules around usage (email vs. e-mail), brand values (trust, integrity), and voice and tone (second person, conversational). Chetan Bhagat has one of the strongest brands in India. Brand CB is so strong that he has been verbed on at least one occasion (“Has Chetan out-Chetaned himself” read one headline). Verbing happens when the public decides your brand deserves it. Few brands achieve such market penetration. Brand CB has. What follows is an examination of Brand CB as it appears in One Indian Girl. Hari, Krish, Gopal, Madhav, Radhika. These are just 5 of the names of Krishna used by Chetan Bhagat for his protagonists. Many fans have wondered why all Bhagat’s lead characters are named after avatars of Krishna. Bhagat rarely shares his personal beliefs as a Hindu. But, in August 2014, as half girlfriend was releasing, Bhagat acknowledged that he is a devotee of Lord Krishna and honors Krishna through his character names. 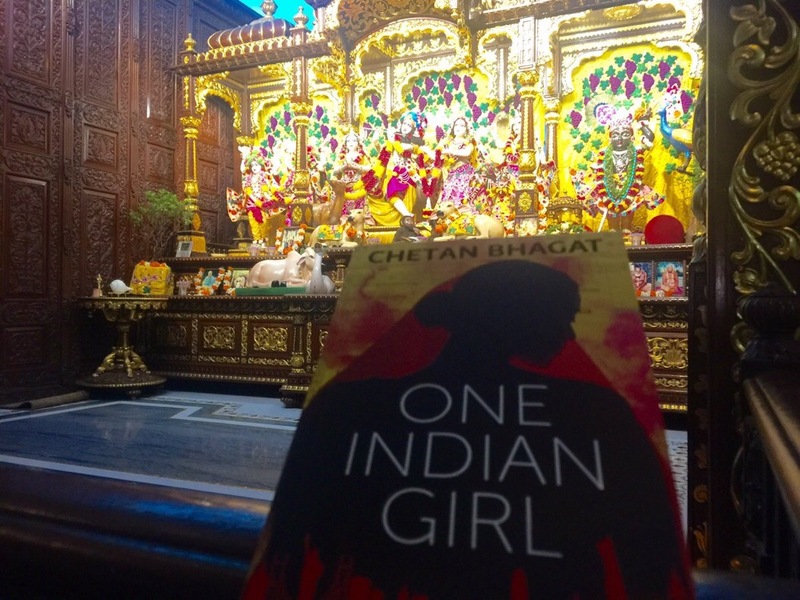 When One Indian Girl released, he visited the ISKCON temple in Chowpatty and offered the book to RadhaKrishna, a photo for which he was heavily criticized and trolled. As proof of plagiarism, Anvita Bajpai has offered, as part of a pattern, the use of the name Radhika. This argument is tenuous at best. For not only is Radhika one of the most popular girl’s names in India, Radha is probably the first female name that pops into your head when you think of Krishna. The use of its derivative is hardly a leap. It’s plausible that this naming example mentioned in Bajpai’s Facebook post is part of a larger pattern. But, from a branding perspective, given Bhagat’s own devotion to Lord Krishna and the connection between the two in the minds of fans, Brand CB seems to have a stronger case. Chetan Bhagat’s voice is what sets his brand apart in the marketplace. His voice is so powerful that many writers attempt to imitate it. And they fail. Miserably. Because that imitation sounds like a hollow bell ringing after it’s been cracked. Only CB can write like CB. Although Judy Balan does give it a good college romance try in her parodies. Brand CB has 2 voices. 1 for his novels (informal) and 1 for his columns (conversational). Most people either read one or the other. I read both. In his columns, Bhagat writes like an IITian. His sentences flow, his arguments (whether right or wrong) are logical, and his solutions, although often panned, attempt to balance an equation. In his novels, however, he writes LIKE HIS CHARACTER. Sorry for the all caps, but I feel the emphasis is necessary here. His first-person narratives reflect how his lead character writes. In 5 Point Someone, Hari writes like a guy who just started IIT would write. In 2 States, Krish writes like a guy who went to IIT/IIM and is just out of school. The writing flows better because Krish writes better than Hari. Likewise, half girlfriend has some of the weakest language because Madhav Jha has possibly the weakest English of any of Bhagat’s characters. If you pay attention, you will see the language improve as Madhav’s English improves in the story. Finally, we come to Radhika. She blends these two voices. Beautifully. She’s way ahead of the Haris and Krishs of the world. She’s been in the workforce longer and has the advantage of living outside India, where her fluency improves. Her English is even a bit American after she works in New York. She uses words like “parabolic” that aren’t typical of Bhagat’s heroes but that tell us a lot about her character. In truth, I think that Radhika’s writing style is the closest to Bhagat’s own personal style we will ever see. Radhika could write Chetan Bhagat’s columns. Radhika must choose one of these 3 men to be her husband. These men represent 3 key Indian male archetypes. Ultimately, these men are meant to represent typical partners for Indian women. That both Bajpai’s story and Bhagat’s have 3 men involved is heavily circumstantial. Bhagat is infamous for his love of numbers. There were 3 main characters in 5 Point Someone and a love triangle in Revolution 2020. You don’t need to dig deep into Bhagat’s bibliography to support the argument that 3 guys at a wedding in Goa is perfect CB branding. When I read the initial excerpt about the destination wedding, it reminded me strongly of 2 States. I thought to myself, “If there’s an argument over the dowry, I am going to ding him in the review.” There wasn’t. Instead, Bhagat gave us Radhika’s 3 idiots. For the record, and to ruin the ending completely, Radhika does not choose any of these 3 men. If Alia in Bajpai’s piece chooses one, that’s another potential argument in Bhagat’s favor. Radhika does not get married at the end of the book. It’s one reason I loved her. She does not choose a man. She chooses herself. She has coffee with Brijesh at the end, but coffee does not a marriage make. Readers are left to decide Radhika’s choice. While some readers have assumed she married Brijesh, technically, no. There’s no wedding. The fact that Alia is married and Radhika is not really makes their stories different in my mind. Regardless of any other plot similarities. I read Chetan Bhagat’s novels for the food, and I don’t think I am the only one. I once bemoaned the fact that I had not had breakfast before I read a scene with chicken noodle soup, veg fried rice, gobi parathas, and rasgullas. My favorite food-related line in the book is “bay-gulls.” At which point, I was in Mumbai and desperately missing a good New York bagel. While this point might not seem relevant to this discussion, I can’t really talk about Bhagat’s brand without talking about food. Sure, many Indian writers use food in their stories. Yet, somehow, his usage has a different flavor. Perhaps it’s the sheer volume with which it’s mentioned. From Hari’s love for chapati to Radhika’s obsession with toast, Bhagat connects to his core audience through food. It’s not a background set piece, but used front and center to communicate character. Bhagat is often criticized that his locales are too filmy and meant to plug into a typical Bollywood blockbuster. This part of his brand identity was not initially present in 5 Point Someone, but developed later. In 2 States, the characters travel to Delhi, Chennai, Ahmedabad, and even Mumbai briefly. Half girlfriend goes from Delhi to Patna to New York and back again. One Indian Girl is no exception. Radhika’s jobs take her around the globe. And, here’s the thing. Bhagat has been to every major location mentioned in the book. Delhi, Hong Kong, London, New York, and even Seoul. Bajpai asserts that Bhagat stole the idea of going to a wonder of the world from her story. Her story is set at the Taj (one of the wonders of the world), and therefore Bhagat sets his story likewise with a world tour that ends at a wonder of the world: Machu Picchu. 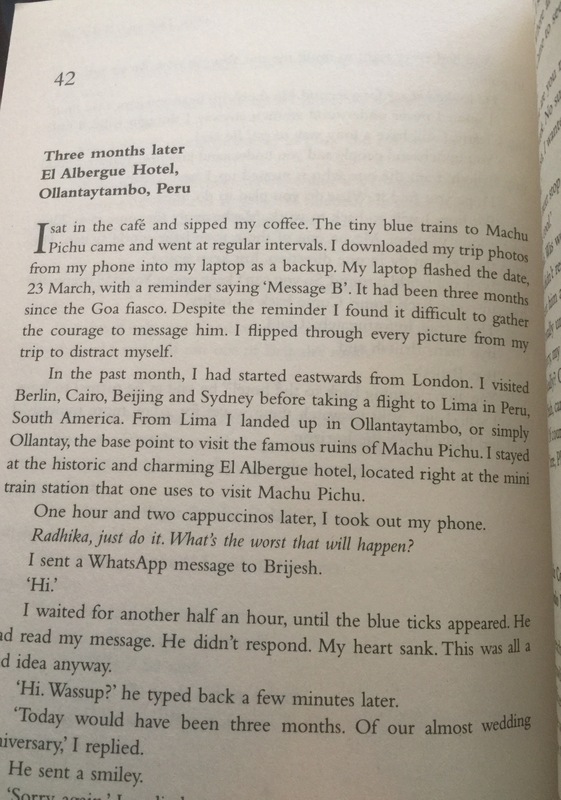 I’ve been following Chetan Bhagat on Twitter since he claimed that the world loves a chaiwallah and remembered a CB tweet from Peru before half girlfriend released. The details were sketchy in my mind, so I Googled “Chetan Bhagat Peru.” What appeared were two tweets from May 2014, more than 3 months before Ms. Bajpai alleges she met Chetan Bhagat and handed him her book. 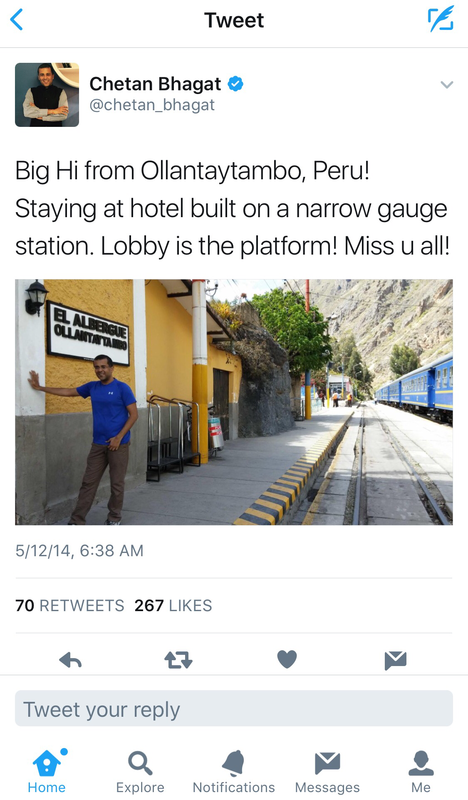 These 2 tweets tell a story: the story Radhika tells in chapter 42 about her time in Peru. Read the sign Bhagat is standing next to. It says El Albergue Ollantaytambo. That’s the hotel Radhika mentions in the book. Now, look to his right. Those blue trains are the ones Radhika describes. 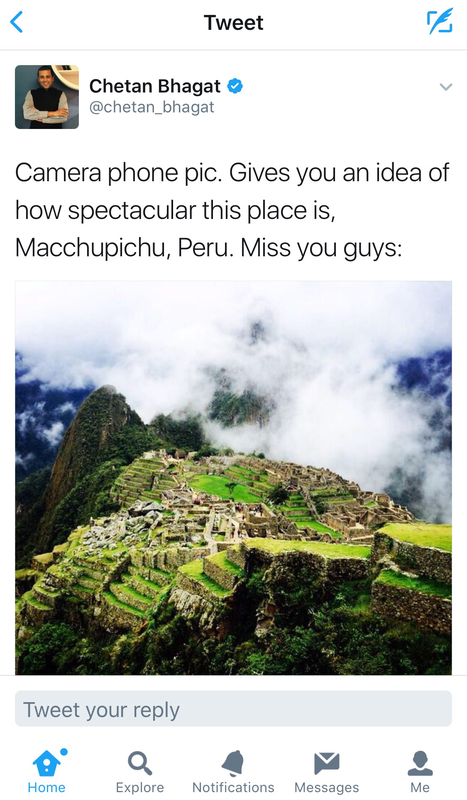 In this tweet, Bhagat mentions taking a pic of Machu Picchu with his camera phone, just like Radhika does. When you set these 2 tweets against One Indian Girl, the origin of the idea to place Radhika in that location is clear: Bhagat’s own trip to Peru. Now, whether he thought, “This place is so cool that I will put it in my next book” at that moment in 2014, I don’t know. Only he can confirm that. But, if it were me, I would think that. My equation might not be mathematically sound, but it reflects my belief that One Indian Girl could not have been written by anyone except Chetan Bhagat. I love how you use facts and logic to make a case. Interesting read this one. Thank you. I understand the pain on both sides. But there’s too much emotion in this case. I tried to remove my bias as much as possible. The original draft actually had my biases listed up front so I could remind myself to avoid them. I cut them because this isn’t about me. It’s about storytelling.